Procedural generation isn't just for video game landscapes and galaxies. The technique for creating vast amounts of realistic but uncannily superficial content goes back a long way. 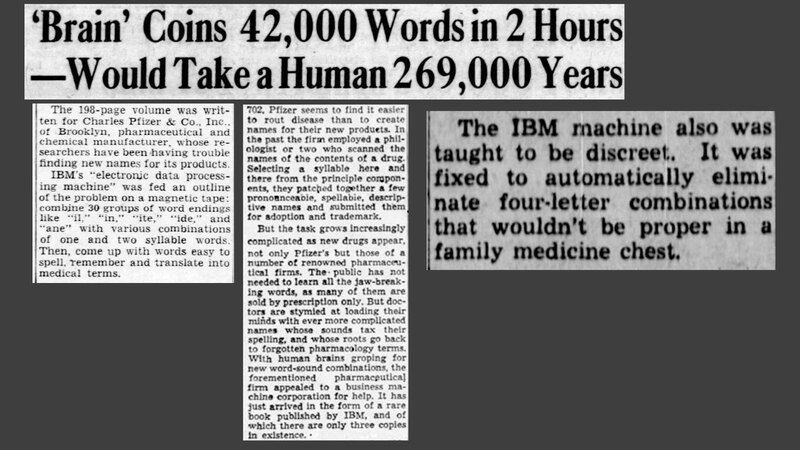 Pfizer used it to generate drug names in 1956, feeding code to an IBM mainframe and getting potential products in return. James Ryan (@xfoml) posted excerpts from news article from the time (above), and it's fascinating to read how it's described for a mid-1950s lay audience to whom computers and their ways were utterly alien. Based on the newspaper's description, Hugo (@hugovk) reimplemented the 60-year-old generator, and now you too can generate thousands of realistic but uncannily superficial drug names. From the full output list I like "coughedore" -- like a stevedore, but for unloading mucus. I wonder how long it took Pfizer to realize that procgen is useless.